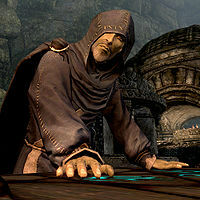 Court Wizards are the jarls' personal mages who research and study magic. They can usually be found in the jarl's palace or longhouse. They sell a variety of spells from all of the schools of magic, and other items that are of use to mages, including soul gems and scrolls. Their selection of available spells and magical items are bested only by the mages at the College of Winterhold. In court politics they are the equals of housecarls, except on magical matters, but less important than stewards. They are usually left alone by their jarl due to the Nords' suspicion and distrust of all things magical. They are also the only members of court that do not have to relocate if their hold changes sides in the civil war. The jarls of Falkreath, Morthal and Winterhold do not employ court wizards. The absence of a wizard in Winterhold is likely due to the close proximity of the College of Winterhold and the locals' disdain for magic, but the reasoning for the other two is unclear. Though it is suggested that Falion is Morthal's court wizard, he has no affiliation with the Jarl's court. Aicantar, Melaran, and Dravynea the Stoneweaver all belong to the court wizard faction. They are all intended as replacements for the incumbent court wizards, but Calcelmo and Wuunferth are essential, preventing Aicantar and Dravynea from being needed. Melaran is supposed to replace Sybille in the event of her death, and he will confirm this in conversation, but he will never adopt her routine or sell anything. This issue has been addressed by version 1.2 of the Unofficial Skyrim Patch; Melaran will replace Stentor as intended.